Employees of the Hythe Ferry are still worried about their jobs, with the 90-day consultation period for redundancies hanging over them. 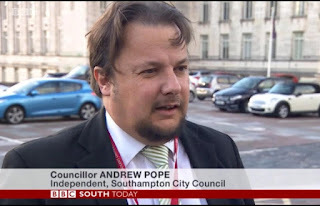 And the users of the Ferry, whether from the Southampton side of Southampton Water or the Waterside side, are still unsure whether the service will continue. Meanwhile, congestion and air quality declines on Southampton's roads because the Ferry service is failing our area. From our meetings and conversations with residents and other interested parties, it appears that the Hythe Pier Train and Ferry Action Group, under the current self-appointed leadership, is incorrectly named. As previously posted here, and gathering a lot of attention from residents of Southampton and the Waterside (we know the website stats! ), it appears that this Action Group is not interested in Southampton, despite the fact that it is the Hythe to Southampton Ferry. Because it appears to us and others that under the current leadership, the Hythe "Action Group" is not really interested in the Hythe Ferry. It only seems to be interested in the Hythe Pier. Surely this can't be true. But if it is then it needs to be renamed to the "Hythe Pier Action Group", surely? Strangely, one of the self-appointed leaders even accused us Southampton campaigners of "bluster". Meanwhile, we experienced and genuine campaigners to save the Hythe to Southampton Ferry and the Pier have been busy trying to save both the Pier and the Ferry. Since our last update, we have met and had discussions with businesses, including a potential operator. We've been in touch with several councils involved in the future of the Ferry and especially regarding its landing on the Southampton side of Southampton Water. We also note Mr Willcock's letter this week in the Daily Echo. We agree with him. Time is running out for the Hythe Ferry and the situation is serious. The "Action Group" does want to save the Ferry, doesn't it, or is it really only interested in the Hythe Pier? Why is it dithering? We've got breaking news for them too. This week, a group of Southampton residents called Southampton Friends of Hythe Pier, has submitted an application to list Hythe Pier as an Asset of Community Value, which would give the Southampton Friends of Hythe Pier extra legal rights to bid on the Pier, if it is put up for sale. This group was organised by Andrew Pope and Denise Wyatt, with assistance from other campaigners. Perhaps it will be Southampton residents that prove to be the saviours of Hythe Pier. We will continue to deliver substantially on our campaigns, while the leadership of the "Action Group" continues to dither and only gives the image of doing something. If you want to join us in our campaigns, Contact Us.